Sometimes I need to come up with inspiration for a particular thing, and now matter how hard I try, I just can’t force it. Other times, when I’m not looking for it, the ideas just form out of life situations and are instantly clear as day and roll out within the week, start to finish. 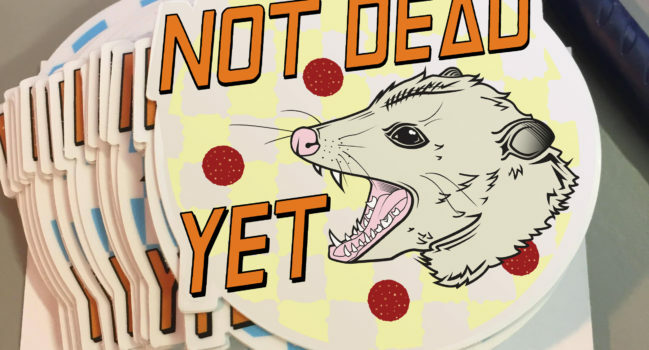 Near the end of 2015, I solidified a logo for local punk band, Not Dead Yet. I wanted the branding to reflect their music, the genre, their musical inspiration, lyrics, band name, etc. – perhaps a corvid skull in a nostalgic Santa Cruz skateboards style. 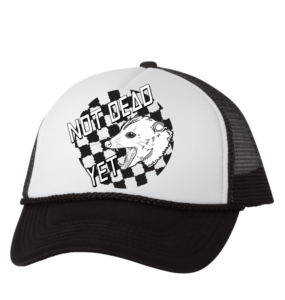 The merch turned out as rad as I had hoped, and now with more and bigger shows happening, it’s time for fresh new items to sell. This past weekend was St. Paddy’s Day. They played a show near campus with Direct Hit and Decent Criminal, and many of the attendees had started drinking around noon as part of a pub crawl of various shows. The singer’s girlfriend, Karoline, told us an anecdote about their roommate leaving a pizza outside on the back porch. It was cold enough outside to keep it refrigerated, so I guess it seemed like a good idea at the time. A nearby opossum thought so too. While baking some St. Patrick’s Day cupcakes in the kitchen, Karoline stepped outside for a moment and apparently interrupted a very snarly ‘possum’s pizza time, and he was none too happy. They dubbed him “Snarls Barkley.” After a late night of drinking, loud music, and socializing (and giggling about Snarls), I woke up, made everyone some coffee, and wearily said, “Chandon should write a song called “Snarls Barkley,” and we should replace the crow skull with an angry ‘possum, and then I could design a t-shirt to go with it where he’s defending a slice of pizza.” The idea was well-received. It seems to work well for the name anyway, as they tend to play dead (but… aren’t yet). So I got way too into it and immediately started designing these ideas within the hour. 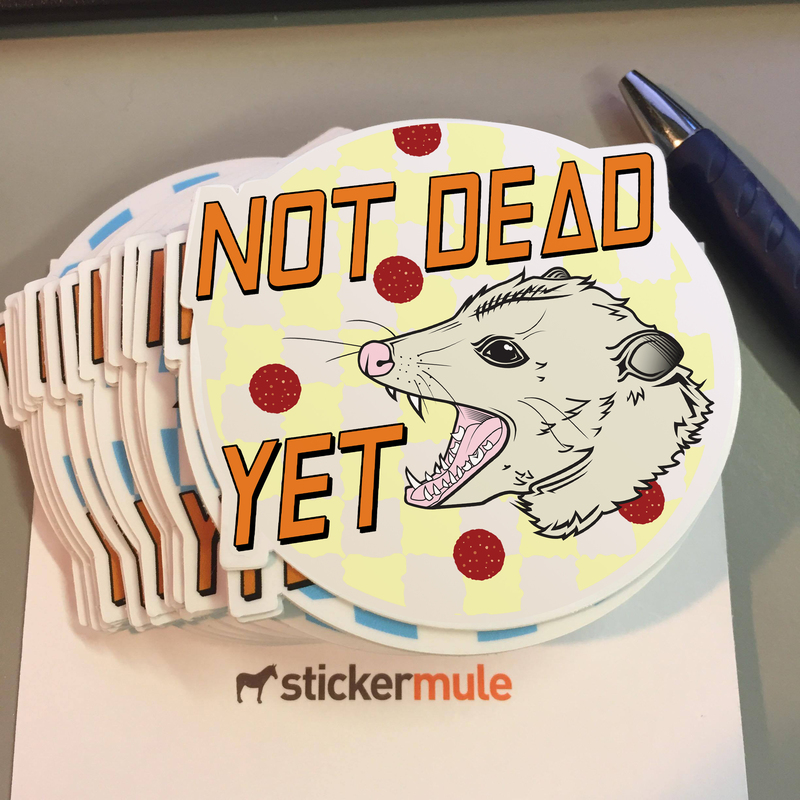 A few days later, I’ve got stickers on order, and the t-shirts and trucker hats are nearly there too. I figured out how to create a Facebook profile picture frame that my friends can apply, and now my newsfeed is just full of Snarls Barkley, which has me just constantly giggling with ‘possum pride. I’ve got some tentative mockups ready to go for social media sharing while we all anxiously await our shiny new merch to be printed by 4th Shift printing.